For over 60 years Lehigh Fluid Power has manufactured pneumatic and hydraulic actuators and valves for cement and aggregate handling applications. Our HDF series pneumatic cylinders, equipped with Lehigh’s exclusive Miracalube self lubricating cylinder piston have been proven to run 50,000,000 linear feet – years and years of service – without any major maintenance required. These cylinders are found in Fuller bulk handling systems, please call us if you have a Fuller part number for identification. When Lehigh began manufacturing cylinder and valve combinations, the valves were mounted to the back of the end cap of the cylinders and they were called air motors. The Fuller Bulk Handling Company needed a cylinder/valve combination with a swivel mounting at the end of the cylinder which necessitated a special manifold to mount the valve at the mid-point of the cylinder which became air motors with the valve mounted piggy-back as in drawings 3LA16 for 4” bore 7.0625” stroke with/ 2MA78 valve, #8 male mounting, stainless steel piston rod, type A thread and the 3LA17 which would have a double solenoid valve 2MA86. There was also a 3LA18 3” bore with 2MA78 and 3LA19 3” bore with 2MA86 valve. 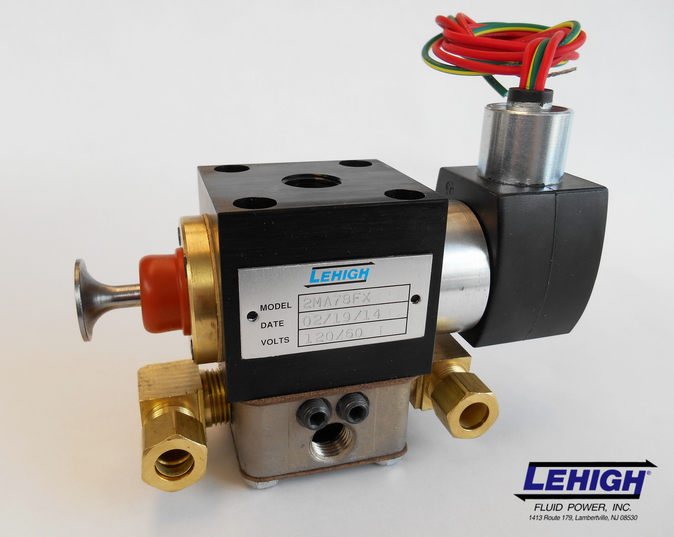 To produce a cost effective combination, Lehigh designed a special air motor for Fuller with the valve mounted on a plate on the cap end of the cylinder and hard pipe the valve ports to the cylinder ports. At the same time, the design reduced the cost by eliminating the front end retainer (flange) and uses a retainer ring to hold the bearing housing and rod seals in place. These cylinder /valve combinations became known as HDF30, HDF40 and HDF50, Heavy Duty Fuller Cylinders. The exclusive 2MA series pneumatic slide valve was designed specifically for Lehigh’s line of air motors. The air driven piston moves the slide and in each of its two positions, the slide opens one exhaust and one pressure port. The adjustable speed controls mounted in the exhaust orifices lead to a single exhaust port. The oversize actuating piston assures positive breakaway action, regardless of dirt in the operating areas or low operating pressures. The slide effectively wipes the seat clean on each cycle, assuring a satisfactory seal even when used with improperly filtered air.